Life can be busy. It can be hard. It does its best to steal our joy and sometimes, just sometimes, it succeeds. I'm going to lay it all out there people, I've been struggling lately. Not in knowing in the depths of my core that God loves me. Not in knowing I'm saved by grace. Not even in my love for God. I've simply be struggling with retaining my joy. Oh, there's several reasons that can claim responsibility. A very busy schedule. Not enough time in the Word. Too much time on social media. Cloud-covered days. Troubled relationships. And even a few discouraging moments that were like well placed flaming darts to my faith. Things like this create the perfect concoction to strike at the core of our joy and remove it from us. Thing is, our joy comes from the Lord, and when we let outside circumstances pull us out of alignment with him, we end up off track and in a ditch. It's not a fun place to be. And though we can often stand back and pinpoint what the contributing factors were, it's not until we do something about them that things begin to change. For me that meant dedicating my mornings this week to time in the Word. I set aside my Bible study and went straight to sitting at God's feet. Bible studies are wonderful tools, and I love them, but when I'm drained it's time to go straight to the source. It also meant less time on social media and more time with real-life friends this week. And this is when something wonderful happened. Do you know what I discovered? Laughter lightens something inside of us. It restores our joy. It releases the heavy cloak of oppression. Friends, we forget we need to laugh. We need to surround ourself with people who stoke our joy. Rather than pulling away, we need to dive into moments with people who love us. We need to drop our heads back, open our mouths, and laugh like when we were little kids. As I drove away from those encounters with my friends, I truly felt lighter yet stronger at the same time. I mentioned it to God who reminded me that "The JOY of the Lord is our strength." So for anyone who's struggling this week, first dive into the Word. Immerse yourself within his presence. Then make a date with a friend. Get off the couch. Turn off your phone. And seek actual connection with someone who can listen and who you can play with. Yes, play. Sometimes we forget as adults to simply be childlike. But we are children of God. Go out. Have fun. And laugh--even if it's forced at first. 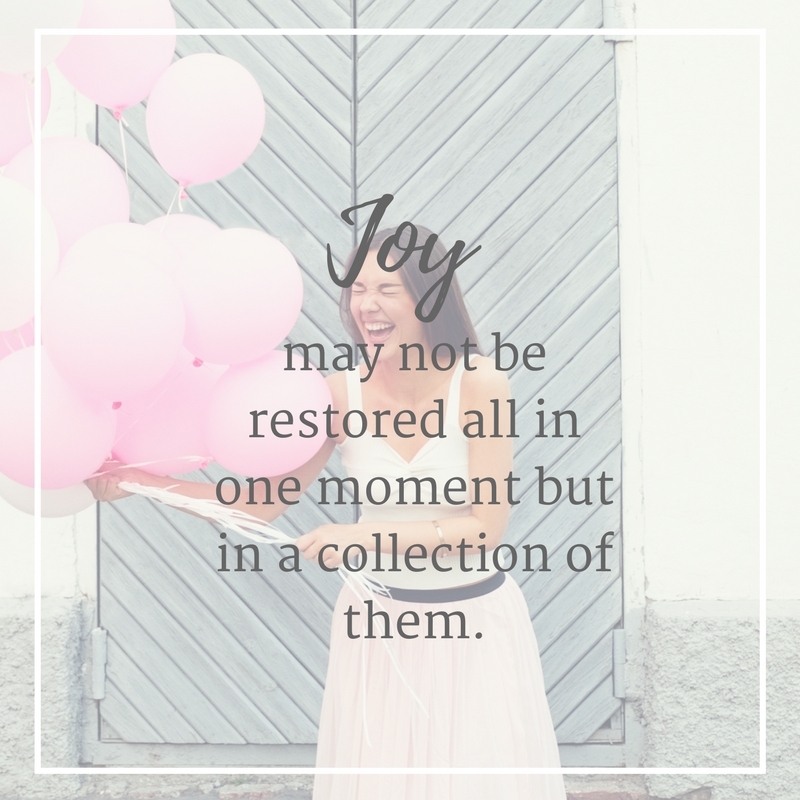 Because joy may not be restored in one moment, but in a collection of them. It involves work and choices on our part. Some days may bring success, some not. But keep digging, keep discovering, and keep holding to God. He is ever so faithful to do what he's promised, and he's promised us joy friends. So go after it with all you've got. Even if you have to fake it till you make it first, the real thing will take hold because God never breaks his promises.